Understanding finance is a critical skill in any role and any sector. 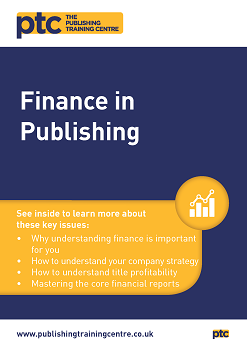 Many of the principles discussed in this Guide apply to other businesses and other sectors, but there is a jargon unique to publishing which makes deciphering the financial aspects all the more difficult. That challenge can feel daunting if your skills are focused on the creative side rather than the analytical. Finance is often cloaked in this jargon and understood by few. But it need not be so, and this Guide is designed to demystify the finances you’ll meet, and remove the cloak of confusion. The guide has been written by Written by Alan Hurcombe, CFO at Egmont, where he heads a team of twelve running the commercial analysis, reporting and compliance for the UK. Alan is one of the tutors for Trade Commissioning and List Management; the PTC course for consumer book editors.